Cruz graduated his medical school in the year 2000 from India before moving to UK in 2001. 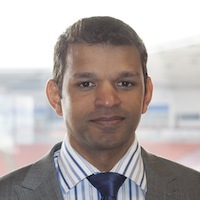 He did his GP training at Blackpool Victoria Hospital and completed his MRCGP and MRCP qualifications. He joined as a GP Principal at Adelaide Street Family Practice in 2007. He was a GP board member of Blackpool Practice Based Commissioning group from 2008 to 2011. Since then he has been a board member of Blackpool CCG. He leads on long-term conditions, scheduled care and information technology. When not at work, Cruz enjoys cycling and he cycled the west coast of USA from Canada to Mexico in the summer of 2013 for a Downs’ Syndrome charity.